Steve Moss interview Part 1. Thanks so much for posting this. My years at New Times were the most exciting, aggravating, creative and fun of my career. It was worth viewing the video if just to hear Steve’s laugh again. He is missed. Boy, watching this brought back good memories, of talks that always went longer than planned.. because it was just too much fun and interesting to end them! Steve was a jewel. 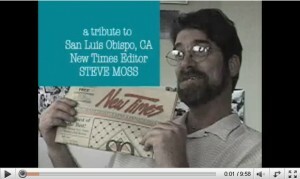 We miss you Steve! Rest in peace.